FDA examines the use of caffeine as a food additive. NBC News' Mark Barger reports. A new line of caffeinated chewing gum is causing jitters among health advocates and prompting federal officials to take a new look at the proliferation of jolt-infused foods, including those marketed to children and teens. 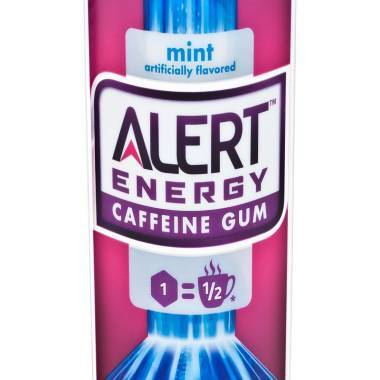 Wrigley on Monday announced the launch of its new Alert Energy Caffeine Gum, which contains 40 milligrams of caffeine per piece – about the same as a half cup of coffee. “The right energy, right now,” is the product’s slogan, according to the website of the company that is a subsidiary of Mars, Inc. The gum comes in blister packs of eight pieces. In response, Food and Drug Administration officials said they would review the cumulative effect of caffeine in an environment in which it’s being added more often to sodas, snacks and other foods. “FDA is taking a fresh look at the potential impact that the totality of new and easy sources of caffeine may have on the health of children and adolescents, and if necessary, will take appropriate action,” Mike Taylor, the FDA’s deputy commissioner for foods and veterinary medicine, said in a statement. Wrigley introduced its new Alert Energy Caffeine Gum Monday. Each piece contains 40 milligrams of caffeine, about the same as half a cup of coffee. At the same time, other foods ranging from caffeine-spiked water to amped-up popcorn have been introduced to a market largely aimed at children and teens, according to the Center for Science in the Public Interest, a health watchdog group. “Could caffeinated macaroni and cheese or breakfast cereal be next?” CSPI executive director Michael F. Jacobson said in a statement. One serving of caffeinated foods isn’t likely to hurt anyone, he added. But the concern is that it will become too easy to consume copious amounts of caffeine throughout the day, sometimes unwittingly. CSPI said a vigorous social media campaign indicated the new gum was being marketed to young people. On its website, Wrigley says that the gum is aimed at adults looking for an energy boost and that it’s not recommended for children or people sensitive to caffeine. Because the gum is not a dietary supplement, the company will not have to submit any reports of adverse events to the FDA, said agency spokeswoman Shelly Burgess. The American Academy of Pediatrics discourages the use of caffeinated energy drinks, saying “they have no place in the diet of children and adolescents,” according to a 2011 paper. It’s not that caffeine should be “demonized,” said Dr. Steven Abrams, a professor of pediatrics at the Baylor College of Medicine and a member of the AAP’s committee on nutrition. But too much caffeine from too many sources could cause problems including anxiety, restlessness and sleepnesses in mild cases to rare problems such as rapid heartbeat and seizures in severe cases. “You’ll get a cumulative effect that’s hard to control,” Abrams said.